1.¤f3 ¤f6 2.c4 g6 3.g3 Ґg7 4.Ґg2 0-0 5.0-0 d5 6.cxd5 ¤xd5 7.¤c3 ¤c6 8.d4 ¤b6 9.e3 ¦e8 10.d5 ¤a5 11.¤d4 Ґd7 12.e4 c6 13.¦e1 cxd5 14.exd5 ¦c8 15.Ґf4 ¤bc4. Previously most attention has been paid to 15...¤ac4. 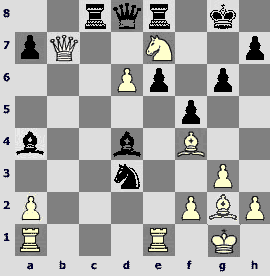 The famous game Karpov-Ivanchuk (Wijk aan Zee 2003) developed as follows: 16.b3 Ґg4!? 17.Јxg4 Ґxd4 18.Ґd2!? 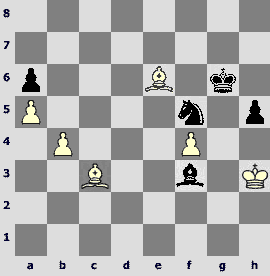 Ґf6 19.bxc4 ¤xc4 20.d6 ¤xd2 21.d7 ¦xc3 22.dxe8Ј+ Јxe8, and a draw in the end. Polish players treat this line more quietly – 16...¤d6 (Miton-Kempinsky, Warsaw 2003) or 16...Ґg4 17.Јxg4 Ґxd4 18.¦ac1 (Miton-Bobras, Lubnevice 2003). Recently 15...h6 has gained some popularity as well (Khalifman-Smirin, Togliatti 2003, and Grischuk-Timofeev, Russia championship superfinal 2004). 16...¤b2!? An interesting attempt to make a draw as soon as possible. 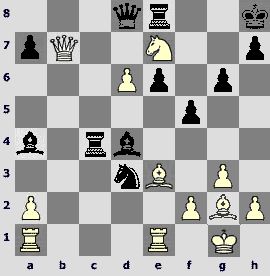 Ganguly played 16...Јb6 against his compatriot Sachdev. 17.Јd2 ¤ac4! 18.bxc4 ¤xc4 19.Јd3 ¤b2. A whole group of White forces in the center is under attack. Carlsen expected that his opponent will be unable to save them all, and to some extent he was right. 20.Јe3 ¤c4 21.Јe4 f5. 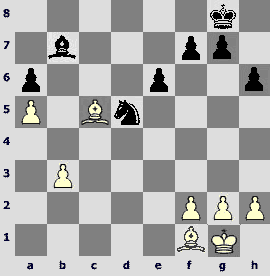 However, Black has to weaken his king. So, White has to return a piece, but his remaining forces are better prepared for arising complications. 25.Јb3! Ґxd4 26.d6+ e6. 26...ўg7 loses 27.Јxb2 Ґxc3 28.Ґe5+ Ґxe5 29.Јxe5+ ўf7 30.Ґxb7. 27.¤d5! Ґa4! 28.Јxb7. It turns out that not everything is so simple – Black pieces control a significant part of the board. The text capture on b7 is the only move. Neither 28.Јb4? Ґxf2+! 29.ўxf2 ¤d3+, nor 28.Јf3? Ґc6 29.¤e7+ Јxe7!, or 28.¤e7+? Јxe7! 29.dxe7 Ґxb3 30.axb3 ¤d3 is good. 29...ўh8? Magnus underestimates the dangers. 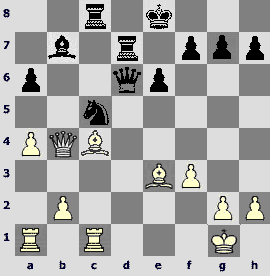 He should have given up the only rook that doesn't hang at a moment – 29...¦xe7 30.dxe7 Јe8. Then after 31.Ґd5! (harmless is 31.Ґe3 ¤xe1 32.¦xe1 Ґxe3 33.fxe3 Јd7) Black has two possible ways to proceed (sorry, folks, it's going to take some space). The more safe is 31...¤xf4 32.gxf4 ўg7 (but not 32...¦c2? 33.¦xe6) 33.Ґxe6 ¦c2 34.¦f1 Ґxa1 35.¦xa1 ¦e2 36.Јa6 Ґb5 37.Јd6 Јc6 (it is not yet possible to recapture on е7, but Black has prepared to a counter-attack after Јf3) 38.Јd8 ўh6! 39.Јf8+ ўh5 40.e8ЈЈxe8 41.Јa3 ўh6 (comes back as it becomes too scary out there) 42.Јh3+ ўg7 43.Јc3+ ўh6 and a draw by perpetual. More lively is the play after 31...Ґxf2+ 32.ўg2 (after 32.ўf1 exd5 33.Јxd5+ ўg7 34.Јxd3? is bad because of 34...Ґb5) 32...¤xe1+ 33.¦xe1 Ґxe1 34.Ґxe6+ ўg7 35.Ґe5+ (Black's task is easier after 35.Јxc8 ўf6) 35...ўh6 36.Јxc8 Јxe7 37.Јc1+ g5. 38.Јxe1 Black responds 38...Ґc6+ 39.ўf2 Ґe4! (но не 39...Јc5+? 40.Јe3). Better is 38.h4! ўg6 39.Јc8 Јe8 40.Ґxf5+ ўh6 41.hxg5+ ўxg5 42.Ґf4+ ўf6. 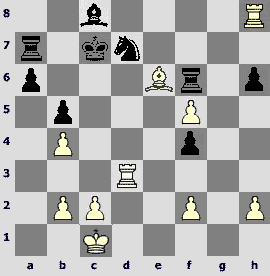 White has to exchange queens, but after 43.Јxe8 Ґxe8 44.Ґxh7 Black must play accurately. For example, a rushy 44...Ґg6 45.Ґxg6 Ґxg3? 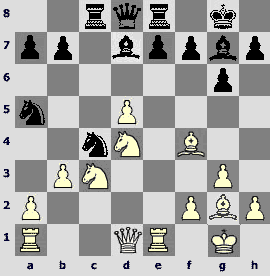 leads to a position, in which black king does not manage to hide in the corner – 46.Ґxg3 ўxg6 47.ўf3 ўf5 48.ўe3 ўe6 49.ўd4 ўd7 50.ўc5 ўc8 51.ўc6. 30.Ґe3! This artful move causes more problems than the capture on c8. 30...¦c4. In case of 30...Ґxa1 31.¦xa1 ¦b8 White should chose a proper move order. If 32.Ґg5 comes first, then after 32...h6! 33.Ґf6+ (33.¤xg6+ ўg8 34.Ґxd8 ¦xb7 35.Ґxb7 ¦xd8) 33...ўh7 34.Јc7 Јd7 Black does not make complaints. 32.Јc7 is more correct with the threat of Јc3 forces 32...¦xe7 (32...e5 33.Ґg5) 33.Јxd8+ ¦xd8 34.dxe7 ¦e8 35.Ґf1with a technically won ending of White. In case of 30...Ґc3 31.¤xc8 ¤xe1 (31...Јxc8 32.Јxc8 ¦xc8 33.¦ec1 ¤xc1 34.¦xc1) 32.¦c1 ¤xg2 33.ўxg2 Ґg7 (33...Јxc8 34.Ґd4+) 34.¦c7 Јf6 35.Јxa7 Black won't escape a check mate too. And a beautiful maneuver of the white queen decides the game by force. 31.Јa6! ¤xe1 32.Јxc4! Ґxa1 (32...Ґxe3 33.Јc3+) 33.Ґd4+ e5 34.Јe6! Black resigned. I suggest to have a look at the Monaco novelty. I've already mentioned that Nikolay Vlassov annotated the tournament games on www.chesspro.ru, that's why we won't go deep into the details, the more so as the rapid format presupposes rapidity and easiness. 1.e4 c5 2.¤f3 d6 3.d4 cxd4 4.¤xd4 ¤f6 5.¤c3 a6 6.Ґe3 e6 7.g4 e5 8.¤f5 g6 9.g5 gxf5 10.exf5 d5 11.Јf3 d4 12.0-0-0 ¤bd7 13.Ґd2 Јa5.This is a very difficult theory. Now Vasily will say a new word. 14.a3!? This is Ukrainian grandmaster's understanding of preventive measures. He noticed that in the main theoretical lines 14.Ґc4 dxc3 15.Ґxc3 and 14.gxf6 dxc3 15.Ґxc3 Black always aims at playing15...Ґb4. He decided to prevent this. 14...dxc3 15.Ґxc3 Јa4. In case of the queen's retreat on b6 or c7 and a capture on f6 there arose positions with a pawn on a2 – when Black plays immediately 13...Јb6 or 13...Јc7. being unable to stand the fact that White will make another extra move, Loek tries to win the psychological struggle and use the tempo that was offered by the opponent. 16.gxf6 Јf4+ 17.Јxf4 exf4. Had it been the ending, it would have been worth the powder and shot. You will see yourself what is going to happen now. By the way, I will mention with sympathetic tenderness that there are five pawns on "f"-file. 18.Ґc4 Ґc5 19.¦he1+ ўd8. 19...ўf8 hardly changes anything. Unless White gets an opportunity to think about 20.Ґe6!? fxe6 21.fxe6. 20.¦e7! ¦f8. White has a won position in case of20...Ґxe7 21.fxe7+ ўxe7 22.¦e1+!? ўf8 23.Ґxh8. 21.Ґb4! Everything is correct - the only active piece of the opponent should be exchanged. 21...Ґxb4 22.axb4 b5 23.Ґxf7 ¦a7 24.Ґe6 h6 25.¦h7 ¦xf6 26.¦h8+ ўc7 27.¦d3! It becomes absolutely clear that black won't get rid of a pin without suffering losses. This is a moment when Black makes his last mistake. 27...¤f8? In case of 27...¤b6 28.¦c3+ ўd6 29.Ґxc8 ¦a8 Black would have one pawn deficit in the rook ending, which is a great luck in such a position. Now Ivanchuk wins the game with least possible troubles. 28.¦c3+ ўb6 29.Ґxc8 ¦c7 30.¦xc7 ўxc7 31.Ґxa6! ўb6 32.Ґc8 f3 33.b3 ўc7 34.Ґe6 ¤xe6 35.fxe6 ¦xe6 36.¦h7+ ўc6 37.¦f7 ¦e1+ 38.ўb2 ¦h1 39.¦f6+ ўd5 40.¦xf3 ¦xh2 41.¦f5+ ўc6 42.c4 h5 43.¦c5+ ўd6 44.¦xb5 h4 45.¦h5 h3 46.ўc3 ¦h1 47.b5 h2 48.ўb4. Black resigned. A theoretical revelation of Alexander Grischuk in conclusion. I will try to highlight the game of Viorel Bologan that was played at the same tournament and on the same subject but in February. They had the same opponent – Sergey Rublevsky. This is an initial position, I won't go deep into the theory if you don't mind. 18.Јd2 ¦hc8. Tactical blow18...Ґxg2 will have a boomerang effect in the shortest possible time: 19.¦fd1 Ґc6 20.Јd6+ with an irrefutable attack. In a few moves Black moves a rook on d8, why not to do it now? The point is that to 18...¦hd8 White will respond with 19.a5 Јc6 (19...Јc5 20.¦fc1 is bad at all) 20.Јxb4+ ўe8 21.f3. Rublevsky does not want to give up an extra pawn so soon. 19.¦ac1. 19.a5? loses because of 19...Јc6 20.Јxb4+ ўe8. The fork is not the only trouble White gets into, after the capture of one bishop, another will be en prise too. 19...ўe8 20.¦fe1 ¤f6 21.b3 ¦d8 22.Јa2 (the threat ofҐc7) 22...¦ac8 23.a5 Јc6 24.Ґf1 Јd7 25.Јa1 ўf8 26.Ґg5. The opponents have successfully coped with their tasks. Black completed the mobilization and moved the king away from the center, White arranged the pawns at the queenside so that it will be possible to regain a pawn and have a pressure in all possible endings. 26...¦xc1. It's possible not to concede c-file– 26...Јe7, then after 27.¦xc8 ¦xc8 28.Јd4 white queen will stand good on the adjacent rank. 27.¦xc1 ¦c8. In case of27...Јd4 28.Јxd4 ¦xd4 29.¦c7 ¦d7 30.¦xd7 ¤xd7 31.Ґd2 White takes on b4, getting the same ending as in the game. In case of 27...Јe7 28.Ґe3 Black would hardly manage to keep the material advantage for a long time, though it's not improbable that he would be able to give a pawn under the favourable circumstances. 28.¦xc8+ Јxc8 29.Јd4. It's clear that White is not in a hurry to give up two bishop advantage. 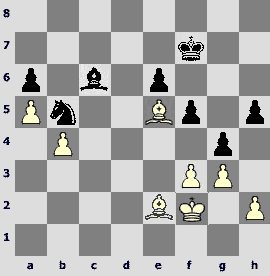 An equal ending arises after29.Ґxf6 gxf6 30.Јxf6 Јc5 or 30...Јc3. 29...¤d5 30.Ґd2 ўg8. In case of 30...Јc7 31.Ґxb4+ ¤xb4 32.Јxb4+ ўe8 White will prepare b4-b5 and will try to use a passer "a" either for the purpose specified or as a destructive object for gaining benefits at the opposite side. His advantage is minimal, but Black should not relax. This is the ending for which Viorel got the applause of our experts. I had a chance to hear different opinions about the opponent's actions, but I've not seen any thorough analysis. Let's try to sort things out. 33...g5 34.f3 f6 35.ўf2 ўf7 36.b4 ¤c7 37.Ґe2 Ґc6 38.Ґb6 ¤b5. Black created a safe shelter at the queenside. It's time for White to think about the creation of the second weakness, but for the time present the position is such that it's possible to forget even about the first one. 39.ўe3 f5 40.g3 ўg6. I don's see the way for White to make progress after 40...e5. If a black pawn is moved on f4, the weakness of f3 pawn will not let White use his pieces freely. To 41.ўd3 Black will respond with 41...Ґd5, setting up a barrier on king's way, and after 41.f4 gxf4+ 42.gxf4 e4 43.Ґc4+ ўe7 44.h4 h5 45.Ґe2 Ґe8 the only attempt to play for a win has to do with king's penetration to the queen side. However, Black will playўd6 with a threat of mating with a bishop from f7, as soon as the king reaches c4, and White will have to beat a retreat. 41.ўd3 Ґd5 42.Ґd4. Using the fact, that it's impossible to transit into the ending with the bishops of the same colours. 42...h5. Sergey could have played stronger -42...f4. Viorel exposes Black's plan shortcomings by a delicate play. 43.Ґe5 g4 44.ўe3. 44.fxg4 hxg4 does not promise anything to White. 44...Ґc6. In the ending "bishop vs knight" after44...gxf3 45.Ґxf3 Ґxf3 46.ўxf3 White should demonstrate a very simple though with elementary courage play: he needs just to bring the king to the queenside and at the queenside the bishop will cope with the task itself, for instance 46...ўg5 47.ўe3 h4 48.ўd3 h3 49.ўc4 ўg4 50.ўc5 ўf3 51.ўb6 ўg2 52.ўxa6 ¤a3 (52...ўxh2 53.g4+) 53.g4 or 48...hxg3 49.hxg3 ўg4 50.ўc4 ўf3 51.ўc5 ўe4 52.Ґb8. 46.h4. Happy inhabitants of the Poikovsky! They saw this with their own eyes, not in the ending manual. Black can not disregard this advancement, as the exchange on g4 will turn into the threat. White will get either a passer "h", or b1-h7 diagonal and a possibility to approach h5 pawn. 46...gxh3 47.ўg1 Ґb7. Black has to destroy a defensive stand and proceed to the active counterplay. 48.ўh2 ¤a3 49.ўxh3. Premature is49.f4 ¤c2 50.Ґc3 Ґg2, and it's impossible for White to avoid a transition into the drawish ending with bishops of different colors: 51.Ґxa6 (51.Ґxh5+ ўe7 52.Ґd2 ¤d4) 51...¤e3 52.Ґe2 ¤g4+ 53.Ґxg4 hxg4 54.b5 Ґf1. 49...¤c2 50.Ґc3 ¤e3. Black had to find a correct idea on the next move– 50...f4. 51.ўh4. Therefore, it was a proper time for White to play 51.f4. 51...f4. A clever defensive idea. Unpromising is 51...¤d5 52.Ґd2 ¤f6 53.ўg5 or 51...ўg6 52.f4 ¤g4 53.b5 axb5 54.Ґxb5 ¤h2 55.a6 ¤f3+ 56.ўh3 Ґd5 57.Ґe8+ ўh6 58.ўg2. 52.gxf4 ўg6 53.Ґd3+ ¤f5+ 54.ўh3 ўh6. The monarch retires from affairs at the crucial moment. It seems that Black defends the last bastion after 54...ўf7 55.Ґe5 ўe7 56.b5 axb5 57.Ґxb5 Ґxf3 58.a6 ўd8 59.a7 Ґh1 60.Ґe2 ўc8 61.Ґc4 ўd7 62.ўh2 Ґe4. 55.Ґc4 ўg6. In case of55...Ґc8 White does not run into 56.b5 ¤d6, but plays 56.Ґe5 first. 57.b5. These seem to be unnecessary finesses.57.Ґc4 is quite good with subsequent b4-b5. 57...axb5 58.a6. It's much more difficult to hold this pawn having the second passer on "f'-file. 58...¤e7. More stubborn is 58...Ґc6. 59.Ґd7 ¤d5. Both 59...Ґc6 60.f5+ ўf7 61.a7 Ґb7 62.Ґe6+ ўe8 63.ўh4, and 59...¤c6 60.Ґe8+ ўf5 (60...ўh6 61.f5) 61.ўg3 are cheerless. 60.ўg3 Ґe4 61.f5+ ўg5. In case of 61...Ґxf5 62.Ґxf5+ ўxf5 63.Ґa5 а-pawn queens. 62.Ґa5 h4+ 63.ўf2 ¤f6 64.Ґc8 b4. A capitulation. However, neither 64...¤g4+ 65.ўg1 h3 (65...¤e5 66.Ґd8+ ўh5 67.Ґc7) 66.Ґc7 b4 67.Ґb7, nor 64...h3 65.ўg3 Ґg2 66.Ґd2+ ўh5 67.Ґb7 saved the situation, and the black knight is helpless against any of the white bishops: 67...¤e4+ 68.ўh2 ¤xd2 69.Ґxg2 ¤c4 70.Ґf1 ¤b6 71.Ґxb5 ўg5 72.Ґd3 or 67...Ґxb7 68.axb7 ¤d7 69.ўxh3 b4 70.ўg3 b3 71.Ґc1 ¤b8 72.Ґb2 ўg5 73.f6, and the king picks his way towards the pawn b3. 65.Ґxb4. Resisting both 65.Ґb7 Ґxb7 66.axb7 ¤d7 or 65.Ґd8 b3 66.Ґb7 Ґxf5. 65...ўg4 66.Ґb7 h3 (66...Ґxb7 67.axb7 ¤d7 68.f6) 67.Ґxe4 ¤xe4+ 68.ўg1 ўg3 69.Ґe1+. Black resigned. I realize that a solid analysis of this ending requires more time and skill than I had. For this reason I did not mark the moves, by the way. Suppose, our dear readers would like to set their own marks. 18.Јb3! Alexander doesn't want to watch Sergey improving his game vs. Bologan. 18...¤c5. If Black continues as in the previous game 18...¦hc8, White gains time because his bishop is protected and is able to make a useful move. After 19.¦fd1 he is ready to bother Black's centralized king. A careless 19...Јc6 20.Јxb4+ ўe8 is answered by 21.Ґd5! In case of 18...¦hd8 White is able to at least restore the material balance – 19.a5 Јc5 20.Ґe3. 19.Јe3 Јc6. Black king looks like an orphan in a variation 19...¦hc8 20.¦fd1 ўf8 21.Ґe5. 20.f3 ¦hd8 21.¦fc1 ¦ac8. The pieces of Rublevsky are located on almost the same squares as in the previous game. 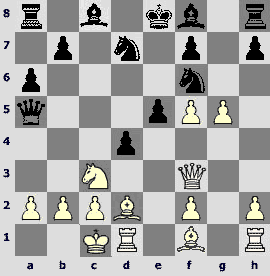 However, Grischuk's queen does not hide in the corners, but undertakes useful maneuvers on the central files. 22.Јe1! A neat double attack on b4 and h4. 22...ўe8. 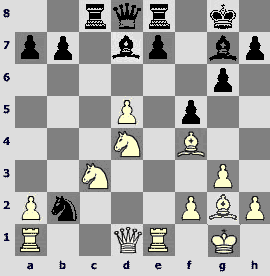 If 22...Јb6, then White doesn't have to care about a discovered check – 23.a5! ¤d3+ 24.axb6 ¤xe1 25.Ґc7 winning. On 22...a5 follows 23.Јh4+. So far Black copes with his problems well. 23.Ґg5! White also has to be careful. Bad is 23.Јxb4? ¦d4 24.Ґe3 ¦g4! 23...¦d4? A strange mistake, which leads Black to a disaster. It was necessary to play 23...¦d7 24.Јxb4 Јd6, and there is still a lot of play ahead, 25.Ґe3 ¤d3 or 25.¦c3 h6 26.Ґe3 ¤e4 27.Јxd6 ¤xd6 28.Ґe2 ¤f5. 24.Ґe3 ¦d7 25.Јxb4 Јd6 In case of 25...¦dc7 26.Ґb5! 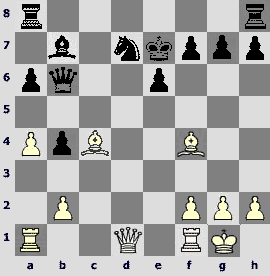 axb5 27.¦xc5 Јd7 28.¦xb5 White is simply a pawn up. 26.Ґf1! This modest move kills Black. The pins are everywhere. 26...a5 (26...¤d3 27.¦xc8+ Ґxc8 28.Јxd6 ¦xd6 29.¦d1; 26...¦dc7 27.¦xc5 ¦xc5 28.Јxb7) 27.Јa3. One shouldn't eat what is poisoned – 27.Јxa5 ¤b3. However, it was possible to play 27.Јb5 ¤d3 (27...Ґa6 28.¦xc5) 28.¦d1 Ґa6 29.Јxa5. 27...¦dc7 28.Ґb5+ ўe7 29.¦c3! ¤d7 30.¦xc7 ¦xc7 31.Јxd6+ ўxd6 32.Ґd2. Once again, as in the previous game, White wins a pawn with this move. However, this time the consequences for Black are much more severe. 32...¦c2 33.Ґxa5 ¦xb2 34.¦c1!? Yet another cool-headed move. Grischuk has no reason to rush with 34.Ґc3 ¦c2 35.Ґxg7. 34...¤f6 35.Ґc7+ ўd5 (35...ўe7 36.Ґe5) 36.¦d1+ ўc5 37.Ґe5 ¦a2 38.Ґd4+ ўb4 39.¦b1+. Black resigns. 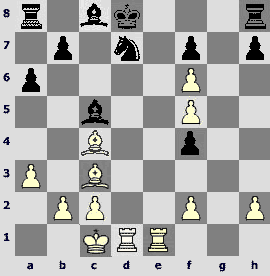 He either gets mated 39...ўa3 40.Ґc5# or loses a rook: 39...ўa5 40.Ґc3+ ўb6 41.Ґc4+.